simple and obvious solution is unwelcome. Capture jaw-dropping gorgeous photos that blow away your friends -- guaranteed! I don't know if I should take that as a compliment or and insult so I will do neither. Have you ever seen a 60 year old inkjet print? Being old and not sleeping as well as I used to, I woke up about 4AM a couple mornings ago with this simple thought running through my mind: The trouble with digital photography is there is no analog output. No, stop, wait a minute! Before you go off on a rant, let me set the ground rules. This post is aimed a specific group: Over 65 years of age, grew up with parents, grandparents and if you were lucky great grandparents, owned a box camera of some kind and worked up from there, you took snapshots because that's what you did with a Brownie Hawkeye, your parents took snapshots with a Brownie Junior Six-20 or equivalent. Now, it is holiday season 1954. The family gets together for a three generation dinner. After dinner everyone is in a mellow mood, a little wine, a drink or two for the adults and a sugar buzz for the kids. The oldsters start to tell stories about the good old days and suddenly grandma's eyes light up and she leaves the room. Two minutes later she's back with a stack of photo albums, grandpa is right behind with his arms full of shoe boxes, it's picture time. Ten minutes later there are pictures and photo albums scattered all over the room. The stories are more animated now, more wine. The kids who are still up start to learn what it was really like in the "Good old days". Now we fast forward to 1963. Great grand parents are gone now and parents host the annual family dinner. Same scenario. Drinks, wine and dinner albums and shoe boxes come out again and we watch another generation grow up. This time though some of the pictures are Polaroid. Still everything is a snapshot. Fast forward again 2018 we are the grand parents, maybe great grand parents. If we are lucky we still have the family dinner, we have too many drinks and too much wine. After dinner we sit around with our family and the topic drifts to the "Good old days". Suddenly my wife's eyes light up and she disappears down the hall and returns a few minutes later with a lap top computer and a stack of SD cards. Probably just an old man's nostalgia but it doesn't seem to project the same warm feelings as passing pictures around and trying to remember where and when they were taken and telling stories about what the mean and not what they show. The medium is the message. No matter what the medium is. No, but 100 years from now people will be looking at 100 year old inkjet prints while laughing at your rejection of technological progress. I guess I fall into the camp of rummaging through old photo albums and shoeboxes at family gatherings. Mom broke her's up and distributed to us kids when she finally moved into an assisted living facility a few years ago. One of the sisters is the "keeper" of most of this historical photos and papers, but I think I have "The Piece." 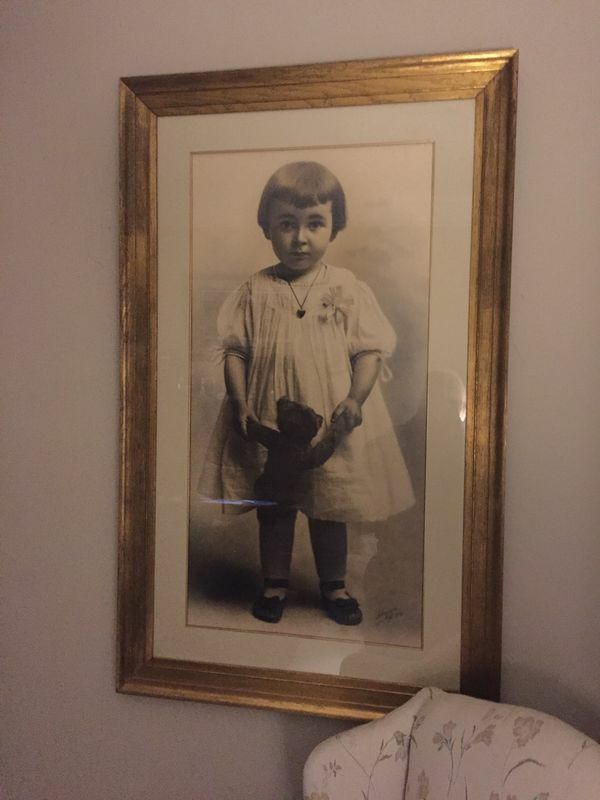 19 in x 38 in photo of my Grandmother from 1907. I was told that one time she hung in the front window of the photographer's studio on Main St., now she is in our den. I can only speak for myself but I come from a long line (5 generations @ one time in the 70's) where we just meet and eat and have a ball sort of gathering in the summer months. That was a while ago and now there are only 30% of those folks still living so I still have the dinners and picnics but I put out these very large & heavy 3-ring notebooks with every photo I took since then with the many cameras I own. I print them from my computer onto 8x10 sheets and slide them into those clear acetate view sheets from the office supply store It's cheap and up to date and indestructible...somewhat and or easily replaced if need-be. It is true that I do enjoy flipping through the many pages of photos rather than doing the view on the laptop or tablet scenario, and people are naturally curios when they spot a large photo album laying on the coffee table. So it isn't very long before it is passed-around to anyone sitting on the sofa to admire and remember stuff. We used to show home movies as well but that got to be a hassle and the old 8mm films were delicate after a few uses in those lousy projectors that we had in the 70's. So NOW....I take those same STILLS and turn them into animated slide shows and onto a flatscreen TV and whoopee.......I'm a movie producer. Hope you enjoyed my novel. Since 2012 Snapchat has kinda programmed a generation of kids/teens that a photo is only supposed to be viewable for a short time before it disappears. And they think that is cool. Maybe cheap copies of old photos should be made. Then you can show them the copy for a few seconds before ripping up the copies. Lol. Just joking of course. But the thought makes me wonder how that would be received. There is hope. My 21 year old son just this past year took many of our fading photos in books and restored them (something he learned at college). He prefers reading a book to reading on a tablet (but he has both),and prints many of his (and my) photos. We have also had photos of an event turned into book form by several different services and they are nice - not quite the same, but not as "cold" as a computer image. Speaking of old, I am 77 and back in the 70's was a stringer for the Charlotte Observer. I love getting out my old papers to remember what was happening at that period in my life. My youngest grandson seems a little interested in old family photos. I am putting names and dates on the backs of them so when I am gone the grandchildren will know who these people in strange clothes are and how they relate to them. Also, I am printing any of my important photos because with changes in technology they may become lost from the computer and that will be sad. Thanks for the wonderful discussion. Those are the things that help make this group feel like friends. Curmudgeon, I'm 75 and totally agree with you. Adding to what you and everybody who commented, I would say that technology although nice and needed and demanded (evolution?) I think the new generation became quite lazy as far as family gatherings, sitting around a fire / fireplace to just let their minds wander on how was the "Old Times". Today, most of our families comes to a gathering, fill up their bellies with whatever meal for the occasion is served, and minutes latter almost everyone remembers they have something else to do, say thanks and head for the streets "sign of the times" they say when we old folks complain about it. Well my family is huge and we keep in touch via WhatSup and Facebook, amongst the "new way" of doing this things. Although my family came from Scotland, Russia and Portugal migrating to Brazil and USA early last century, we still have the habit of getting together at least once a year when most of us are able to meet. Today, my brothers, and cousins are keeping the meetings going and several of my nephews and nieces are picking up the tradition. My wife recently went through her boxes of photos to send to her daughter and son. In the event of her death they would get them anyway. She knows exactly which photos to send to each child (both adults now with their own children) so it saves me from having to do it later. I know at least one granddaughter who will enjoy going through the photos now, she is 10. What the two families will do with them through the years is up to them to decide. Both of my children are deceased so I cherish the photos I have of them. Of course I don't look at their photos every day but I want them close to me for when I do. I do have a few photos of my father as a child and his father. I sit here typing this and am realizing that pretty soon those prints will be 100 years old as my father was born in 1921. Wow! I don't know. In 1954, I was only 1 year old, but by 1964 (fast forward to 63 does not work because we all had only one thing on our mind that holiday season! RIP JFK) my family was watching 8mmm movies and slide shows. Technology progresses. But it is true that people do not sit down together to look at family history any more. They just share it on social media. Sad but true. Suddenly my wife's eyes light up and she disappears down the hall and returns a few minutes later with a lap top computer and a stack of SD cards. That's what I like about digital. Albums can be nice from a nostalgic point of view, but digital photos aren't going to fade or start becoming red. I think we have the best of both worlds! I make both CDs and prints (my printer and best paper and ink) and give copies to my daughter and son-in-law and my 3 grown grandsons. My son-in-law has a rolling display on a large digital frame in the Family Room. I live alone but I'm surrounded by my family photos...past and present! Memories must be preserved...one way or the other!